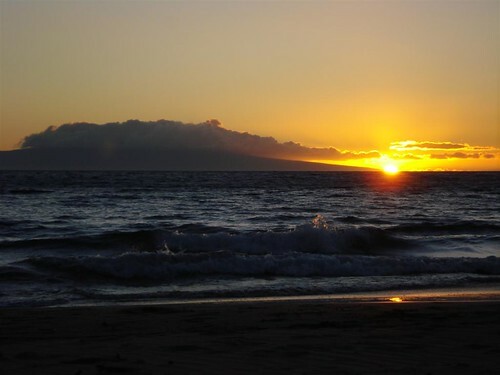 As most of you know I am spending the next 8 days on the beautiful island of Maui visiting Jake and Kara. They are leaving the Hawaiian islands soon to move onto bigger and better things. I always told them I’d come visit them before they left, so it was time to make good on my promise. Since this whole thing was spur of the moment I was able to score a good deal on round trip tickets down here. I was unfortunately not able to score a good deal on the person I sat next to on the plane. Nor should the word ’score’ be used in the same sentence in reference to said person. She was….’interesting’ to say the least. Curly grayish, thinning hair atop a head and whole body that has seen waaay too much sun. Long, wonky teeth that could eat corn on the cob through a tennis racket, and bony elbows that constantly found their way across my arm rest and into my arm. Crazy Lady: (at me) Where’s the mustard? Me: They didn’t give us any. CL: How can they not have mustard? I need mustard! Me: (stuffing my face) I dunno. CL: Well this is ridiculous I can’t eat this w/o mustard. She flagged down someone to go find her dang blasted mustard, but they never came back. Insane woman offered me her sandwich but I didn’t want it because she had spilled crazy all over it. The bag lady came by picking up everyones trash and my fellow passenger threw the whole sandwich away. Moments later a male flight attendant came by with a glorious packet of mustard, pleased with himself he presented it to her as if it were a highly desired delicacy. CL: Oh, well this is no good! I just threw my sandwich away! The other steward told me you didn’t have any mustard. Male Attendant: I’m sorry ma’am. There was a whole bin full of different packets, I had to dig for this one. We are out of sandwiches, can I offer you something else? She began ranting again about the service/mustard/everything while she was stuffing chips in her mouth. I was sad that she felt the need to rant right then, because more chips were shooting out of her mouth during the rant than were staying in. Gross. I landed safely, got picked up and then had time to burn. I walked around some town that I cannot pronounce, smiled at a few Hawaiian honeys and finally settled into a small hippie cafe for lunch. I went to the beach near Kara’s work and snapped this photo. Don’t be deceived by beautiful blue water. It was a tiny, sorta nasty beach, but it’s still Hawaii. Once my two hosts were off work we went back to their place and hung out. We drove around and they showed me a bit of their small town. We decided upon a local Vietnamese eatery which was mostly tasty. I ordered the lemongrass chicken but it should’ve been called lemonsalt chicken, as it was incredibly salty! After the food, we got our beach chairs, stogies and headed out to watch the sunset. It was fantastic. Except Jake and I discovered just how hard it is to light our cigars on a windy beach with little matches. How many matches does it take to light two robustos? The whole pack. We relaxed and laughed, got our feet wet and watched the sun set on the calm water. The sun sets at 7:15pm here and there really isn’t much twilight, it gets dark very quick, so that was a bit of a surprise. But it’s beautiful and relaxing and warm. After the sunset we went to Safeway and I quickly realized that Jake was not a liar. : ) Food is way more expensive here, and I mean…that makes sense and all but its something you just don’t think about. I got salad fixins and thought it’d be great to get some bell peppers to go with my salad. I left the peppers on the shelf as they are $5.99 a lb! This is definitely my week to lose weight. I spent $53 on not very much food. Oh well, I’m here for the friends and scenery not the bell peppers. The most irritating thing is my wonderful logic was completely backwards. I’m sorry you had to deal with crazy lady, but it did make for a hilarious story. Thanks for the evening entertainment. I hope you have an amazing time with Jake and Kara. Awesome! Have some fun for me! I’ve never been there, but I hope to someday I almost fell off my chair laughing, reading about crazy lady. I hope you have better luck on the flight back!